The Office of the District Attorney, O.R. Barris III, is making preparations for the Ninth Annual Victim’s Tree for Okmulgee County. 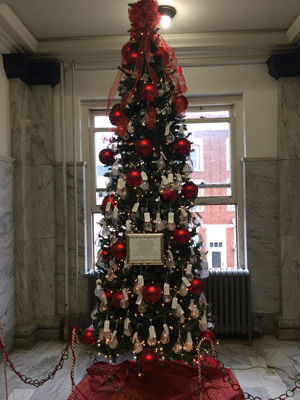 The project, coordinated by the Victim Witness Coordinator Debi Woodard, is designed to place a tree on Courthouse property which honors victims of violent crimes whose lives were lost in Okmulgee County. Ornaments displaying the names of the victims decorate the tree and will be on display on the second floor of the Courthouse during the upcoming Christmas season. While the loss of loved ones is felt throughout the year, often times it is even more painful during the holiday season. Assistance for the project has come from a variety of civic groups, government agencies and private citizens. A special thank you to Okmulgee Wal-Mart for donating the trees and bulbs not only for Okmulgee County, but also McIntosh County and our newest facility, Safe Harbor. “Christmas trees help us all celebrate the Season and remind us of family and friends we love. This Christmas tree serves to honor those who have been the victims of violence in Okmulgee County. For those who have lost them it is my hope that the ornaments containing the names of those whose lives have been taken serve to honor them and their loved ones. We in prosecution and law enforcement have not forgotten and count it as a privilege whenever we can bring their killers to justice”, said District Attorney O.R. Barris III. If you have lost a loved one to a violent crime in Okmulgee County, please contact Debi Woodard at 918-756-0794, Jawanna Wheeler at 918-938-0782 or Kelsey Kossakowski at 918-752-2939.